The other highlight was Wagons, a country-rock band from Melbourne named after their lead singer. Henry Wagons looks like a bearded Rainn Wilson and doesn’t hold back on the comedy, so much so that the band only played a couple of songs during their set while Wagons had the audience laughing at his antics and good-natured Canadian insults. Wagons expects to be back in town later in the year when the band’s album is released here; you’ll want to remember their name. 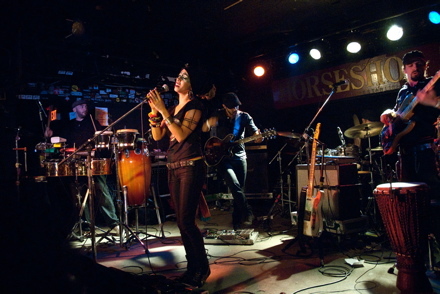 The Aussie bands at the Horseshoe joined the Jezabels and Birds of Tokyo as standouts of this year’s CMF. Most of the contingent is off to New York and then Austin for next week’s SXSW festival in Texas. Looking forward to seeing them back in Toronto soon. Posted on March 13, 2011 at 6:29 pm in Music Writing, Toronto News	| RSS feed You can	trackback	from your own site.